I spent the first part of this week in Chicago, which is rapidly rising to the top of my list of Favourite Cities. Whenever I'm there, everything just feels "right," especially when I'm riding the "L."
Of course, when one's accomodations are exquisite and several fabulous meals are consumed, it's difficult to find fault with anything. I managed to return with an even stronger love of amber glass globes and buttercream-coloured Fiestaware in addition to another few salient (and knitting-related) items. No trip to downtown Chicago is complete (for me,) without a stop at Loopy Yarns. How can one not love a yarn store housed in an old train station? I want to marry their entire wall of Cascade 220 which, to me, is heaven. They carry every colourway. 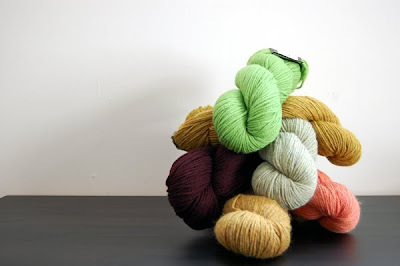 I limited myself to six choice skeins: They seem like quite a springy group, don't they? These are (probably) destined to be a felted bag that I'm currently designing. I had the pleasure of riding the "L" over to Andersonville where I visited the Swedish American Museum's store. They had yarn on hand, as I had hoped they would. I departed, richer by four skeins of Sisu: ...and a charming Dala horse bag, which turned out to be perfect for carrying yarn (which is always a good thing.) It really was a wonderful trip. Now I'm experiencing a sort of state of city-withdrawal. I hope to make it back to Chicago sometime in the summer. March 18, 2010 at 11:20 a.m. So glad to hear you enjoyed our city! Looks like you made the most of it. I had no idea that the Swedish American Museum had yarn -- the last time I visited I wasn't a knitter yet. 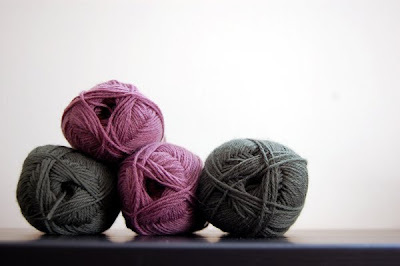 Next time you should check out Nina, a lovely yarn shop in Wicker Park. Plus there are great boutiques, cafes, and bars (including a speakeasy with amazing cocktails) right nearby. March 18, 2010 at 11:23 a.m.
March 18, 2010 at 11:42 a.m.
You've inspired me to visit Chicago again. It isn't too far from here but I never go. It's time!! March 18, 2010 at 11:46 a.m.
My DD has Northwestern on her shortlist. Would be a good excuse for me to visit Loopy! March 18, 2010 at 3:39 p.m.
March 18, 2010 at 6:05 p.m. I love Chicago. Love the people, the vibe, the food - just a great city. March 19, 2010 at 8:25 a.m.
Oooh... those colors are wonderful! 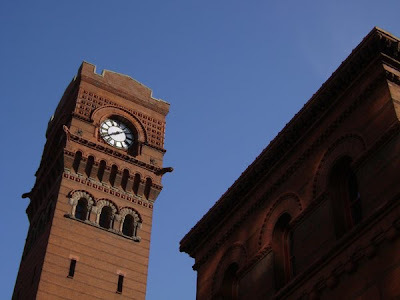 I had two sisters who went to school in Chicago, so I have spent a lot of time there. I always tell people that I know Chicago way better than Detroit (which is very true). I know how to get from place to place in Chicago. Detroit (which is only an hour away from me)...clueless! March 19, 2010 at 9:23 a.m.
Ah I'm so glad you liked it here! Loopy is definitely my LYS of choice. They have such great selection and the staff is always so kind and helpful. And I've heard about the Swedish American Museum and now that I know they sell yarn and adorable tote bags I'm going to have to check that out! March 19, 2010 at 10:21 a.m. I never went to Chicago. I know where to stop now if this city is ever on my path. Thanks for this info! And by the way, I really like the yarn you picked out, especially the Sisu! March 19, 2010 at 11:49 a.m.
March 19, 2010 at 1:19 p.m.
@Frida and @Ms. Kimba -- Thanks! It's much the same for us Canadians with things like maple sugar candies and hats with beavers and loons on them. Also, I did see bags with what I thought at the time was moose on them in the shop. They must have been elk, after all. March 20, 2010 at 2:45 p.m. I had to go look up the difference between a moose and an elk, in Europe, we don't make a difference, both elk and moose is a north american moose, but we call it an elk, confusing. :) So I then it was a moose I was referring to, in swedish we call it an älg. March 21, 2010 at 1:24 p.m. I checked it out once after I moved back to america...apparently they are cousins..but basically the same thing. March 21, 2010 at 3:52 p.m. So glad you loved Chicago!! I moved here from NYC about 12 years ago and haven't looked back. It truely is a wonderful city!! I wanted to buy a place in Andersonville (my last name is Anderson...and I lived in Sweden for a bit too). That is such a great neighborhood too. 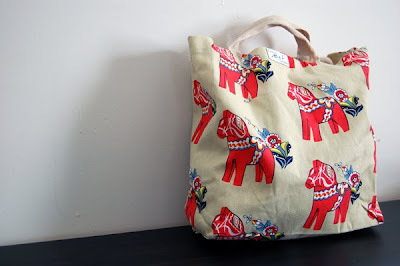 Anyway, I am going to go up the museum this weekend to buy your tote. March 22, 2010 at 6:01 p.m.
Like the Dalahorsebag sooooo much. May 10, 2010 at 7:36 a.m. The Gnome Mittens are finished!